The words below were written on the way back from my visit to Auschwitz-Birkenau on November 19th 2013, they are unedited, a raw brain dump of my experience, and until today unpublished. Something in me just hadn’t been able to share them but today marks 70 years on from the liberation of the camp, and it somehow felt right. The full set of my photos from the visit is available here. Nothing can prepare you for the scale. 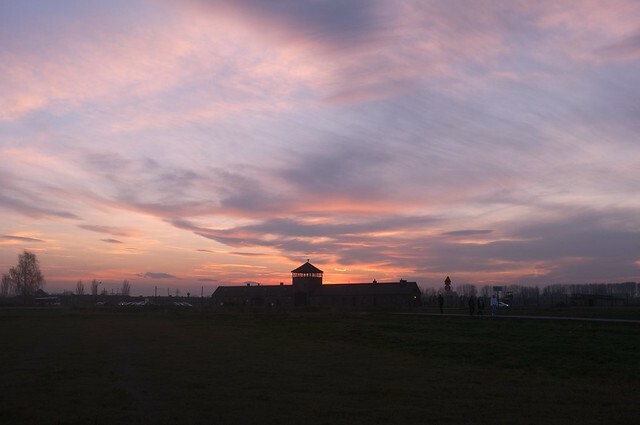 Looking out from the main tower on Birkenau, it is hard to grasp the enormity of the camp. It really is mind blowing. This is the second part of the tour, and really puts things into horrifying perspective. The day had started much earlier at Auschwitz I with an excellent guided live audio tour through the State Museum. 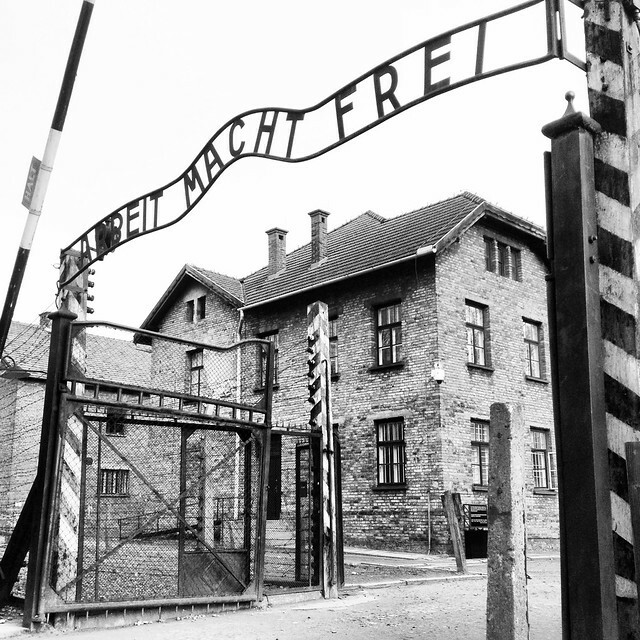 Those familiar words “Arbeit Macht Frei” over the main gate are a grim welcome to the visiting masses from all over the world. The words were just another trick in the Nazi arsenal, designed to fool their prisoners into a slim and ultimately false hope. We move from barracks to barracks, each room an increasingly sad reminder of why we are here, collections of old luggage, prayer shawls, spectacles and shoes of all sizes (the tiny children’s shoes being the most upsetting) before a warning that in the next room there are to be no photographs. As we pass through the doors, our guide explains why as we are presented with 5000kg of human hair, removed both before and after execution and sold for profit by the Nazis. One of the most shocking things I have ever witnessed. Between barracks 10 & 11 lies the infamous execution yard with a wall at one end where prisoners were lined up and shot. This after being subjected to standing cells where up to 4 prisoners would be placed within a space no more than 1 metre square overnight with no light and little oxygen. Such punishment cells were used to promote fear and encourage the “collective responsibility” principle that was commonplace in the Nazi death camps. In one room we are shown a huge pile of empty canisters. 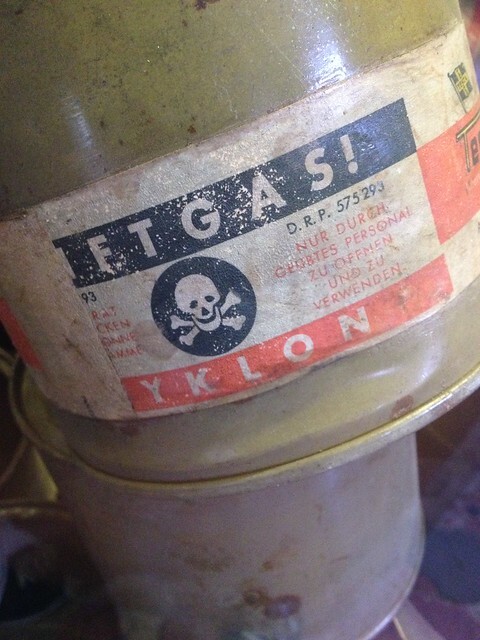 The faded label reads ‘Zyklon B’ and carries a skull and crossbones warning of its danger. This sample of canisters was barely a drop in the ocean of what was used by the Nazis to gas the 1.1million Jews that suffered at their hands during WWII. 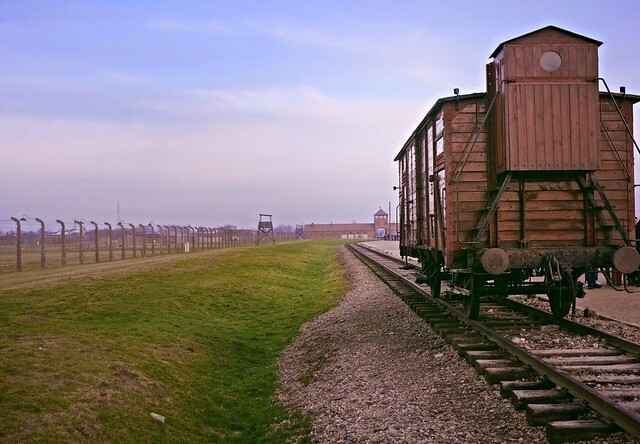 The camp had been created with a clear goal in mind – to wipe the Jews from the face of the earth – yet upon arrival, none of the prisoners knew what awaited them. Those in the camp who had witnessed the atrocities spoke nothing about their fate, knowing that it would serve no purpose and that certain death awaited if they did. As I walked round I was struck by the realisation that there was no-one to tell, no-one to reason with. The situation was perfect futility. 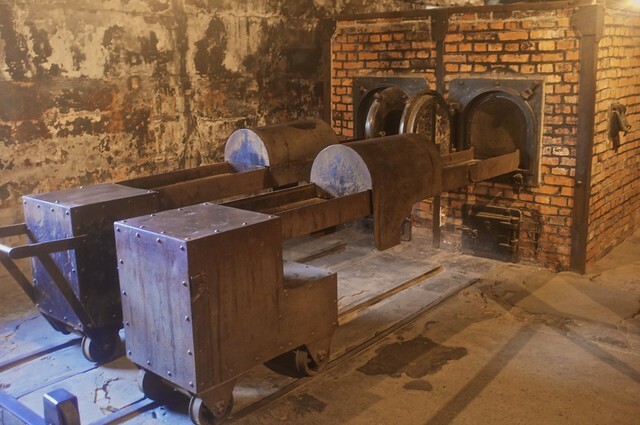 The final part of the tour in Auschwitz I takes us to the first gas chamber and crematorium. We are taken through the doors, into the ‘changing area’ before moving into the chamber itself. Marks on the walls that look like the desperate scrapes of human hands are all around the room. And then on, into the crematorium where Jewish men were forced to remove and carry the bodies into large ovens, having first removed all hair and any gold teeth from the victims. This ‘primitive’ chamber was the forerunner to the mass execution rooms in Auschwitz II in Birkenau. A proof of concept. After a short break to try and take things in, we make the short journey to Auschwitz II/Birkenau. This purpose built camp had its own railway sidings in order to make the offloading of prisoners as simple as possible. 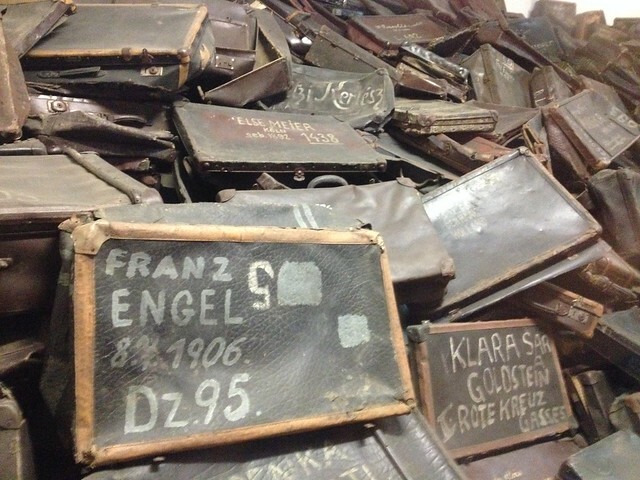 Once offloaded, the prisoners were ‘processed’ with the majority of Jews being sent straight to the gas chambers. A single cattle wagon still lies on the tracks, similar to those that were crammed full upon arrival with unsuspecting Jews, hopeful of the promise of a new life in the East. Several hundred meters down the track, we stand at the top of a set of stairs. 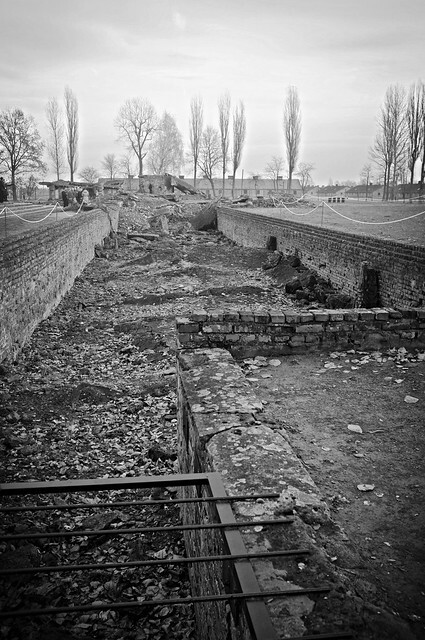 This is Crematorium I (1 of 2 on the camp) and seeing those steps leading down into the now collapsed ruins of the building, our guide explains how the Nazis once more tricked their prisoners. The promise of a shower before getting clean clothes and assigned to a barracks was made and all went willingly, up to 1500 at a time descending into the sealed void below the ground, death taking anywhere between 2 and 15 minutes. Survivors recall the bodies piled high, with men climbing to reach the last gasps of oxygen at ceiling level, babies and children at the bottom, helpless as the gas overcame them. 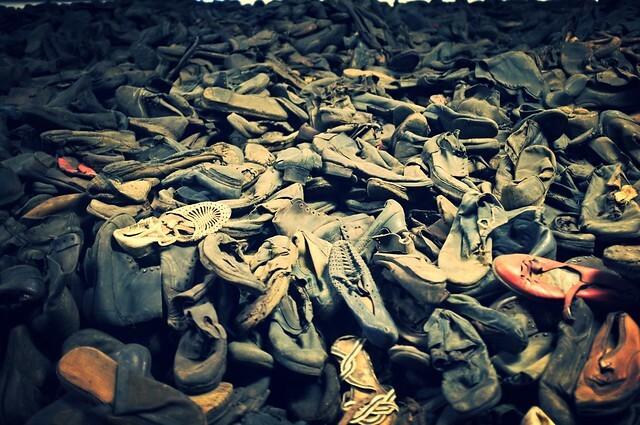 The horror of the holocaust cannot be underestimated. 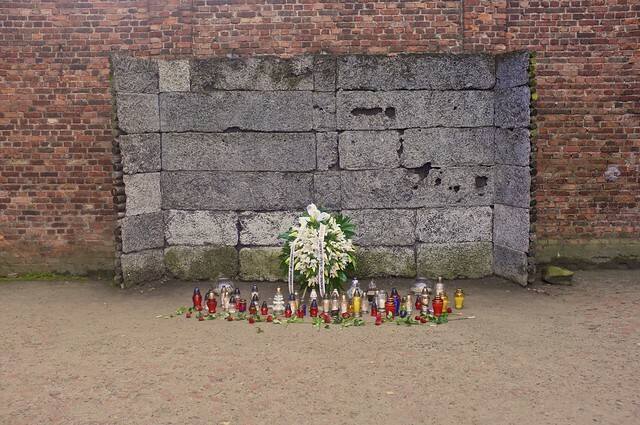 Each of the 2 chambers at Birkenau was capable of murdering and incinerating 4500 people per day, the ashes of the victims cast into huge pits alongside the buildings or poured into rivers or used as compost on the surrounding fields. 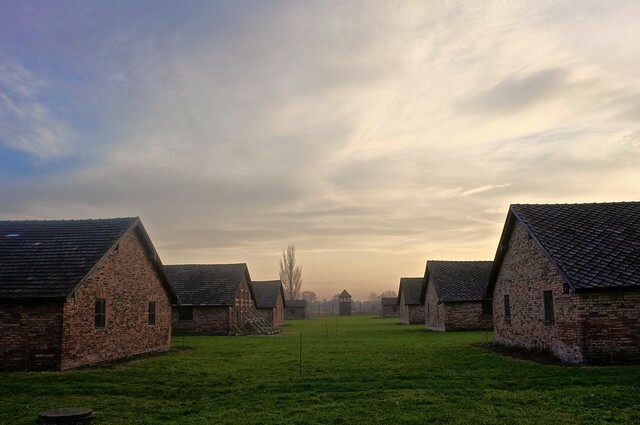 As the sun fades, we make our way back to the main gates via the barracks, this time much more basic than Auschwitz I (which had been a former Polish Army camp prior to the invasion), the bunks stark and cold and housing up to 7 people per level. 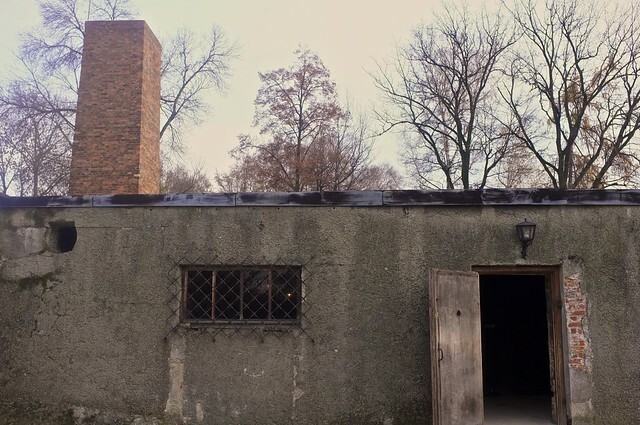 Such squalid conditions accounted for many of those that the gas chambers spared. And as I stand in the watch tower, overlooking the camp as the sun finally disappears, I am left blown away by the scale. Nothing can prepare you for the enormity of the place. Nothing can prepare you for the shock that humans were capable of such organised and mass murder. 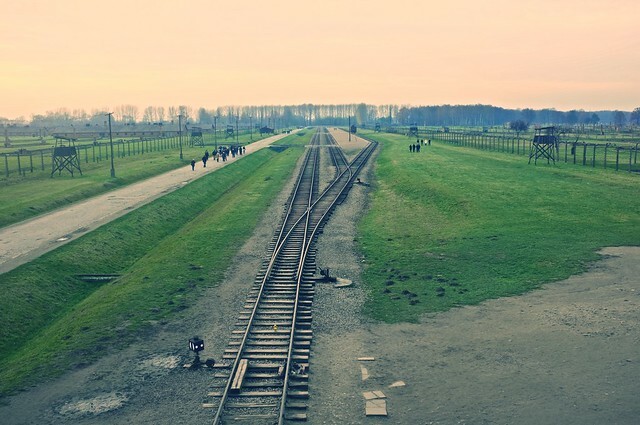 For those of you who find yourself in a position to visit Auschwitz/Birkenau, you really must, if nothing else it is a reminder of the ease with which humanity can fail.